Match Nantes-Guingamp Ligue 1 the fixture is set to kick-off today 14:00 on Stade de la Beaujoire. Refereee Jerome Brisard. Team Nantes is located in the middle of the table. (15 place). Nantes in 5 last matches (league + cup) have collected7 points. From 2 matches no lost a match. In this season games Ligue 1 the most goals scored players: Emiliano Sala 8 goals, Gabriel Boschilia 3 goals, Kalifa Coulibaly 1 goals. They will have to be well guarded by defense Guingamp. Players , Gabriel Boschilia 3 assists will have to be very well guarded by defenders Guingamp, because they have the most assists. Team Guingamp is in the releagtion zone of the table. 20 position. Form team looks like this: In the last 5 matches (league + cup) gain 7 points. Guingamp did not win the match from 3 games. From 5 matches no lost a match. Leading players Guingamp in Ligue 1 is: Nicolas Benezet 3 goals, Marcus Thuram 3 goals, Nolan Roux 1 goals. Players Nicolas Benezet 1 assists will have to be very well guarded by defenders Nantes, because they have the most assists. In Guingamp not occur in the match due to injury: Lucas Deaux, Nolan Roux. 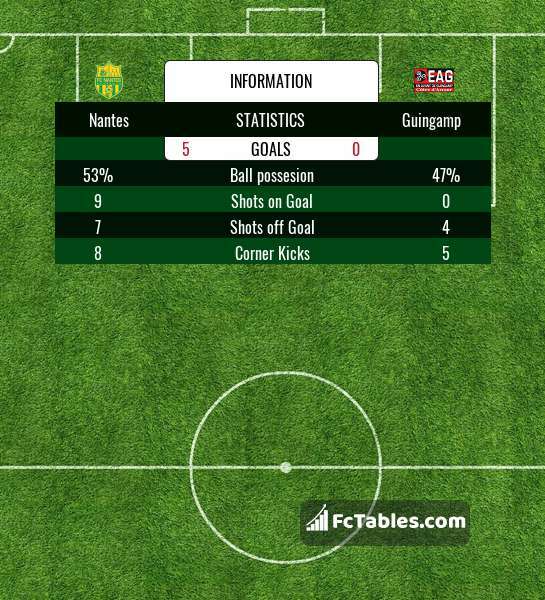 Direct matches: Nantes won more direct matches. 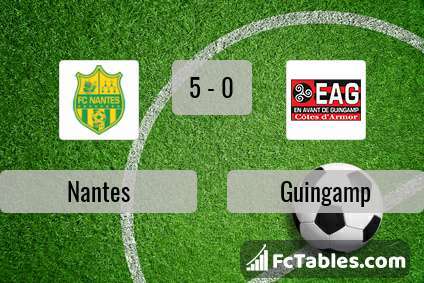 Nantes won 13 matches , Guingamp won 9 direct matches, was a 7 draws. In 10 matches the sum of the goals both teams was greater than 2.5 (Over 2.5), and 19 matches teams scored more than 1.5 goals (Over 1.5). In 10 matches the both teams scored a least one goal (Both teams to score).